In today's BidAndAsk series, we invited the four authors from The Traders’ Blueprint: Winning Strategies for Profiting from Stocks, Forex, Commodities and Options. You'll learn what it takes to become a profitable trader. What exactly is The Traders' Blueprint and why they came together and wrote the book. What would they recommend for someone who wants to quit their 9-5 and start trading full-time. 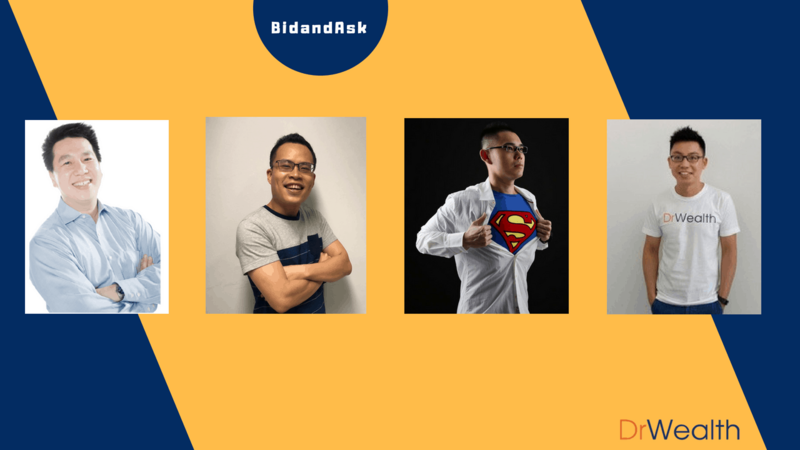 Marc Liu – an ex professional gamer who competed as part of Team Singapore, Marc Liu is now a trader, investor, and educator who works as a business partner to Collin Seow. Rayner Teo – an ex-prop trader who left the industry to become an independent trader. He is the founder of the educational trading website, Trading with Rayner, which seeks to help and empower retail traders. With 41,000 readers per month, Rayner is the most followed trader in Singapore. Alex Yeo – the co-founder of DrWealth, Alex Yeo is a self-directed options trader—works as an independent trader trading his own personal account. He is also a certified financial technician as accredited by the International Federation of Technical Analysts (IFTA). 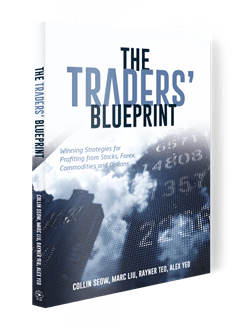 Collin took the inspiration of creating “The Traders' Blueprint” from when he was writing his previous book, “The Systematic Trader” which details his journey and methods on overcoming his $250,000 debt by turning it into profits through stock trading. “The Traders' Blueprint” follows suit but this time with the help of his friends: Marc Liu, Rayner Teo, and Alex Yeo. The book contains the most favored strategies and techniques in trading put together by these four traders. There are many perceptions about trading. And these can either make or break any newbie who wants to try out the markets. So we asked Marc Liu and Rayner Teo to share some of the common misconceptions people tend to fall to about trading. Trading is often perceived as a fancy occupation. This, according to Marc Liu, is the common misconception made by people. He said that people tend to think how trading can be learned in six months time. Right after that, you can own get yourself in a luxurious high lifestyle. But far from that, Marc pointed out how trading is in fact a very tough game just as any profession. It requires a lot of time and effort. No matter how smart you are, you still have to go deep into the trenches in order to properly understand and do trading. From there, you’ll be able to get to know how the game works. Marc was very candid when he pointed out how trading won’t be perfected but it will get easier eventually. He acknowledged how the markets are very very random and volatile. Sticking to a strategy you’re comfortable with will take you far. Speaking of game, we also asked Marc what are some of the skills in gaming that can be applied to trading. His answer boils down to seeing trade as a game. When playing a game, he said how it is important to know what works and what doesn’t. If the game changes, you have to learn how to change according to it. Most of the time, your opponents will play differently. And once you see that, you have to be prepared for it. When you are gambling around the roulette, the casino wouldn't know how over the next five rounds, ten rounds, or twenty rounds whether it's going to make money. It doesn't trade predict whether it’s going to make money in the next rounds of gamble. But in the long run, the casino knows it’s going to make money because of the edge that they have in their system. And this is the same for trading. You're not trying to predict what a market will do tomorrow, next month, or even next week. Instead, you as a trader, what you should be focused on are basically learning how to adapt with the changes. So it's like trading. You are not just simply putting on trades. You will not know which one will turn into a huge winner, or will ride the big trend. But what you do know is that those that don't play out, you will remove. You cut the losses. And those that do work out in your favor, you just simply know to ride the trade for as long as you can. Rayner was very keen on this. He said how finding your edge doesn’t have to be done alone. Rather, it would be best to consult many sources to get one that best suits you. He advised reading through academic journals or others that are already proven by traders. Basically, find an edge that is already been proven statistically. These edges have surely undergone some rigorous testing. The hard work has been done for you. Once you have identified your edge, the next thing you can focus on is how to actually take this edge and develop it into a way that you can actually execute this in the markets. You can maybe focus on stocks, maybe you are going to focus on the effects and futures market, and etc. So take what's really proven out there and adopt it into your own trading style or personality. This is the easiest way that Rayner recommends most traders to do. This one, as Rayner says, is admittedly more difficult to do. Yet, there are a number of people who do find success with it. It is to basically rely on your own trading journal. The trading journal is usually common to a lot of day traders or short-term traders. It is where they record most of their trading activities: how they enter the trade, how they exit, how they manage their trades. The journal tells them what works and what don’t. After a sample size of recorded activities—from a hundred to two hundred trades, traders can look back on the journal and see what are the patterns or the trading set-ups that make the money. From here, they can start to focus on those patterns. Also, through the journal, traders will also realize what are the set-ups or patterns that actually cost them money in the long run. Likewise, they will try to avoid picking those setups or even to constantly refine and improve them. This is the second way of identifying an edge in the markets. However, Rayner advises how this approach would be good to consider among short-term or day traders. As they say, one of the best teachers is experience. So we asked Alex Yeo and Collin Seow to share some of their biggest losses that they have overcome. For Alex Seow, his most memorable loss happened in 2014. It was when he first started trading options. That time a crude oil was trading at about $100. Regrettably, there was a sell-off and it crashed from about $50 to $30. He held on to his view and unwilling to cut loss. So in option speaks, he kept rolling his position. As a consequence, he lost and wiped off about 40% of his account! The only grace was that his account at that time wasn't very big so it didn’t really hurt him. But in percentage term, forty percent is a lot money. With Collin, his most memorable loss was during the euro crisis. He said how it was the time when he broke almost all of his rules, namely: to not hold any position on holidays, and to not listen to any tips. He went to Hong Kong for holidays. During that time, there was this deal that made him hold positions. On top of that, there was this person who was at a high position who shared with him a fantastic tip. Unfortunately, the euro crisis happened and the particular stock dropped a lot in the morning. Instead of cutting loss, he decided not to close the position and at the end of his Disney trip, he lost about two hundred thousand. The saving grace is after the whole thing, he closed out all of his positions and came back to Singapore. He then started to trade back and about three weeks, he was able to close back to about 80 percent of the losses. This loss has definitely taught Collin some lessons: don’t hold out positions on holidays; don't believe in tips on whether how high is there; and then lastly, if you see it’s wrong, just get off no matter what was said. One of the things traders must look for is an approach that best suits them. There are a lot out there. It can be short-term traders or pursuing trade position trader or the long-term trader. There’s really no one-size-fit-all. So he suggested exploring on these things. Understand how each different type of trading methodology work. Also, one has to consider their own schedules and commitments. Given that, you would then be in a better position to know which trading approach would suit you best. So for example, for someone with a full time job, it doesn't make sense to be a day trader. Longer term trading, position trading, or swing trading might be better suited for you. Or perhaps for someone who is more emotional, it would be good to prefer trading with more objectivity. You might want to go with systematic trend following for example. It all boils down to understanding yourself as well as the methodologies that will suit you and your team best. Dive in deeper and learn everything you can about it. This could be through reading about trading courses, going to seminars, looking up traders with similar trading approaches you want to emulate. Alex also expressed the same sentiments. He advised new traders to learn more about trading. They could read books such as “The Traders’ Blueprint”. They could attend courses and even join some community where they can get like-minded traders to discuss everything. He also added to learn as many strategies as possible to identify what they prefer best and even find out about their preferences. There are a lot of people who are on the fence of quitting their job to do trading full-time. This is a dream that usually falls out of the expectations for most that they ended up regretting it. When asked for the advice on this method, Marc and Collin unanimously discouraged people from doing so. The first reason for Marc goes back to the misconception of associating trading with the posh kind of lifestyle. As often seen on advertisements, people tend to be swayed into thinking how trading is an easy job. Therefore, you need to think of a number of things: And for a start, if you want to do it for living, you really need a certain account size. You need a big account size, generally a very big account size. This depends on how much you want to make per month. But you have to also remember how the market is very volatile. You have to look at how, for example, even the likes of Goldman Sachs and those kind of big banks, when they trade, they don't always trade in and out all the time. The reason is that it depends on the volatility of a market. So it's a fallacy to think that you can make more money as what some of the books say. It’s not really true. Most of the time, the market is actually in portfolio mode in the sense that it really doesn't move that much. Portfolio, meaning you put your money there. It’s like an index fund. It moves up 1 or 2 percent, sometimes in a good manner, and 80% of the time the market is actually doing that. So it's only when the market starts to get very volatile, as in Brexit happens or these kind of stuff happens, where you know the traders in those big banks will actually go to do a little bit of intraday trading because the volatility is dead. So the thing is you need to know the markets very well, as well as the instruments you trade. Marc recommended using options as an income replacement for a start but you also need to know your stuff. Furthermore, he added that also depends on what kind of instruments you trade, whether you trade your stocks or you trade options. They’re all slightly a little bit different. This brings us to first knowing your craft in order to be comfortable with it. The second thing he recommends is to not go into heavy intraday trading. You have to think how we are still human beings after all. You might think how at the beginning, trading seems like a glamorous job, that you are doing something very high level. But you have to consider other important aspects that shouldn’t be overlooked like your overall health. Therefore, for Marc, the best thing is to do trading on the side and invest stocks that are doing well in a manner where you can slowly shift your attention to it in incremental stages and not to simply quit your job and do it full-time. On Collin’s side, leaving your job to trade full-time needs experience. Most people often overlook this fact. So what he advice is for people to maybe invest or trade in a longer time frame because it all boils down to the psychology in trading and investing. You need to have the right mindset. You need to have the right strategy to do that. So one of the things Collin says people can do is to start with a real small account and from there, scale up to a bigger account. Another important thing he notes is how when you are trading, you are exchanging time for money—the time spent looking at the chart and looking at screen with money. For this, Collin suggests to look into algo trading. As an example—how do you instead of trading a market, develop something that trades the market? An answer he gave is creating a robot, one that understands the market, reach the market and from there, trades the market. The robot has no emotions. All it has to do is just to backtest, and make sure that your system is robust. The robot can look at ten things at one time. When we do this instead, we have to accept the fact how it can be tiring. But with a robot, you can trust that it will not tire of doing the same repeating job over and over again. They actually better help you to scan the market, look at the market, and replace you in trading. What is the Minimum Amount to Trade Full-Time? As you have been reading, you might wonder what is the minimum amount to actually trade full-time. According to Alex, that would be to have at least 200,000 Singapore dollars. Assuming that the trader is very proficient and you can get a 20% return in a year, so $200K and 20% percent bring you to around $40,000. Taking that amount it will give you an ideal of what how much you can make from full-time trading. So 200k would be the minimum. However, if you don’t have 200K trading capital, it is best you take trading as part-time and slowly grow your capital. Collin Seow: You can best connect with Collin at his blog, Collinseow.com. There, you will find out more about the market—from what to buy, when to buy, and how much to buy. By going to this site, you can even participate and meet him at the webinar. Marc Liu: As Collin’s business partner, you can easily go to the same website and read up on his writings. Rayner Teo: You can go down to his website and blog: TradingwithRayner.com. And there you can find many of his educational materials. The posts he publish there are all free. Alex Yeo: Being the co-founder of DrWealth, you can simply visit this website. You can also get in touch with him through email at alex@drwealth.com.